When I sat down to enjoy the sunshine and do a bit of sketching in the Don Valley trails on Sunday, I chose a young sapling to sit in front of. Not for any particular characteristic of the tree, but just that I like to have something at my back. I didn’t pay much attention to the tree initially, and I hung my camera bag on a broken-off branch before sitting down. When I got up and reached for my bag, I happened to notice these lines on the bark. They’re obviously made by some sort of insect. Curious to what it may have been, I started poking around the ‘net. The answer to this question was not nearly as easy to find as I had expected it to be. Between yesterday and then again today I’ve spent several hours typing in search terms into Google and checking out promising links. This is easily the longest I’ve spent on researching a post to this point, and I didn’t even come up with anything conclusive for all that effort. Research for my posts usually starts with a single, rather vague, descriptive term. 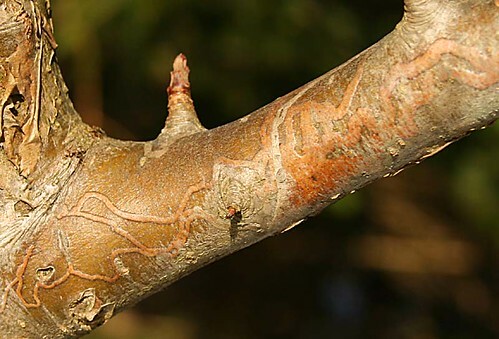 For instance, when I was researching the Black Knot information, my first term was “black crusty growth on twig”. You usually get a few misses at first before hitting on to what’s obviously the correct identification. In this case I started off with “bark miner”. I’m familiar with leaf miners, which create tunnels between the two surfaces of a leaf, and this looked very similar. It seemed like a pretty obvious connection, but the search produced no viable hits. I changed my approach. 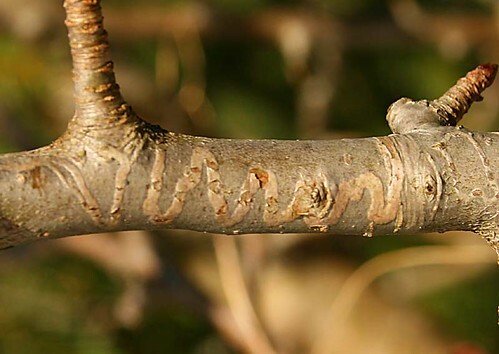 “mines under bark lines on surface insect branch”. This turned up a lot of not very useful stuff, but did contain one page that had something. It was a fact sheet on the Allegheny Serviceberry. What does that have to do with insect mines? It had a section on pests. The first paragraph read, “Cambium miners cause concern when noticed but are not very damaging to the tree. The mines can extend from a twig all the way down to the roots. The mines form light-colored lines in the bark.” Aha! A lead! So the next search term was “cambium miners”. 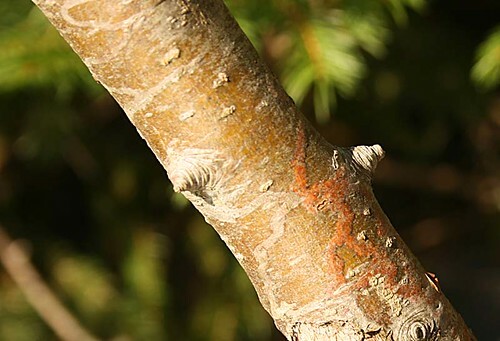 The cambium is the layer of reproducing cells in a tree located between the outer bark and the inner hardwood which is the source of the tree’s outward growth. It’s just a narrow layer, and in a young thin-barked tree like ash, maple, birch, and other deciduous species, it’s pretty close to the surface. This seemed promising. Most hits I found just simply called them cambium miners, without identifying the species or even the order of insects they belonged to. I didn’t find this especially useful. However, after poking through a number of hits I came across a page from an online resource called Tree Dictionary. The page seemed to be focused on pests of trees as well, and included a lot of information on various fungi. Also paragraphs on sapsuckers, squirrels, frost, beetles, and, the object of my search, cambium miners. The page indicates that cambium miners are flies belonging to the genus Phytobia. The flies lay their eggs on branches near the top of the tree, and the young larvae mine their way through the cambium down toward the roots, where they stay till they pupate. There isn’t actually a lot of information on the life history of this genus on the web, at least that I turned up in my initial searches. I was able to determine that there are a number of different species that have different host preferences, and some are cambium miners while others are leaf miners. Knowing the species of my tree would help. I’m not certain, as it’s a small sapling in the middle of winter with no leaves. I can rule out birch fairly safely, I would think, and cherry, because there aren’t any horizontal lines. Beech and maple would be grey. Hawthorn would have spines. But that still leaves me with an assortment of options, including common species like ash, and less common ones such as alder, hickory, etc. I’m leaning toward ash, given the location and its commonness. On the website ForestPests.org I found an informative factsheet on the Ash Cambium Miner. The page indicates that the larvae of this fly mine in straight or serpentine tunnels near the top of the tree, but the further down they get (and presumably, the older they get), the more their tunnels take on a zig-zagging appearance until they’re distinctly so by the time they reach the roots, where they’ll spend about 10 months. They overwinter there, then exit the roots in late spring and pupate in the soil. I continued to poke around, pressing on and changing the search terms to see if I could turn anything else up. I had a few other potential culprits, including flat-headed borers (metallic wood boring beetles, the group that includes Emerald Ash Borer), and small moths of the genus Cydia, but none of the online resources seemed to match as well. I’m still not positive on calling them Phytobia sp, either, given that I couldn’t find any resource showing their mines to be able to compare to the ones I photographed, but the information all seems to match pretty well. Today I spent the day laying laminate floor in the family room at my parents’ house. 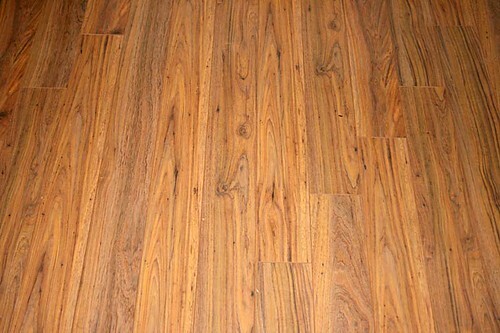 I’m pretty sure that laminate wood flooring is a little like vinyl tile in that they make the wooden planks out of pressed particleboard (or something resembling it) and then print a design on top, rather than laying an actual wood veneer over it. However, I assume they use an actual image of woodgrain to create the print image, so the laminate planks represent actual woodgrain patterns. What does this have to do with cambium miners? Well, on both of the sites mentioned above, they indicate that the mines left by the larvae get grown over as the tree continues to grow and result in small discolourations in the wood. These show up as small dark marks on stumps when the tree is cut or, as in the case here, in wooden planking, where they’re called “pith flecks”, among other names. They apparently don’t show up in ash wood very well, but are fairly noticeable in most other types of wood. I’m not sure what type of wood this laminate is supposed to be an imitation of, but it’s got a distinctly reddish tinge. Here’s a close-up of the pith flecks in the woodgrain of the laminate print. You can see nearly all of them are associated with the tree-ring growth mark, where the larva would have been tunneling close to the surface of the bark (the dark growth line). A couple of the marks are further in; apparently there are some species that will occasionally feed in the xylem (the layer under the cambium) for short periods, and that could be what these are. 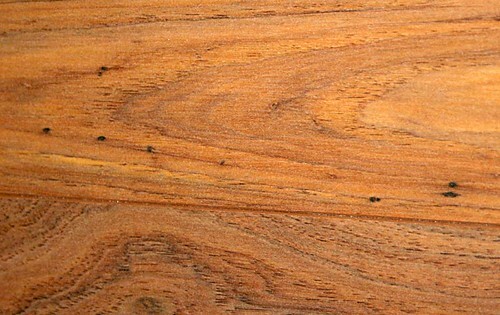 Despite that these marks are due to insect damage, they’re not generally considered defects of the wood by most lumber manufacturers, but they are recognized as such by the Fine Hardwood Veneer Association (who knew there was such a thing?). I suppose that, over the course of a tree’s life, there’s a good chance it will be infested at least once so it would be hard to completely eliminate the marks from wood products. When I suspect a dye job on wood, I look for repeats. Thin veneer will give almost-repeats; the same pattern, sliced a millimetre away from the first layer, and subtly different. Looking at your flooring photo, I could not see any repeats. There’s an “almost but not quite” in the 4th and 6th boards from the left. You may actually have the real thing. Great research. I admire your tenacity. I give up too easily. It’s possible you’re right, Susannah, I’ll have to have another closer look at the patterns. I have a feeling that since this wasn’t especially expensive laminate that they’d probably opt for the cheaper route of printing the pattern, but you never know! Very informative post. I admire your persistence. Fortunately, I have a fairly large nature library close to hand; this kind of detailed natural history information is still easier to find in books than online, i find. Thanks, Dave. I’d certainly like to have a good library on hand, as, like you say, many things are still easier to find in print. Unfortunately, neither the wallet nor the shelf space allow it right now. The internet is so extensive now, though, that you can usually find what you’re looking for if you just look hard enough. 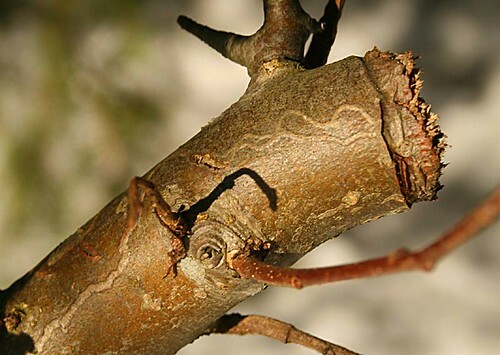 You may be correct in identifying the insect as a cambium miner, however, there are multitudes of insects that can attack a tree in that manner. One of them being Emerald Ash Borer, if the tree that you were looking at is an Ash tree you should contact your local forestry agency. Emerald Ash Borer has been found in Ontario. I see signs along roadways warning of the Emerald Ash Borer and have known a couple people involved in various projects, and agree that it is of serious concern. I don’t think this was them, though; my impression of the borer is that it tends to attack larger trees that have a thick layer of bark already established, and more resembles bark beetles in terms of visible damage than it does cambium miners. Your first four photos show bark mines of Marmara species (Gracillariidae). Cambium mines of Phytobia spp. are not externally visible. Oops–I see see from the “pingback” above that you already figured that out using my book! I just stumbled on this old post while looking for photos of Phytobia mines.